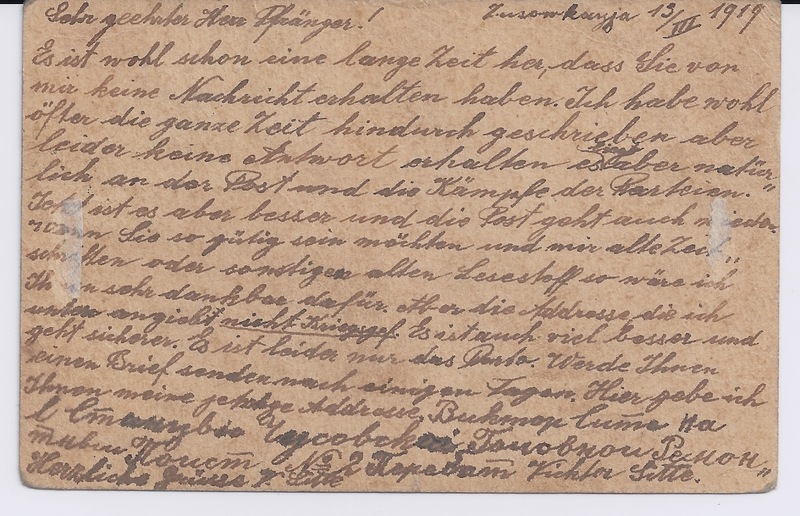 After the end of hostilities between Germany and Russia and the signing of the Treaty of Brest-Litovsk in March 1918, it is quite common to see Prisoners of War or ex-Prisoners of War still trapped in Russia writing home using stamped postcards rather than Free Frank privilege Prisoner of War correspondence cards. My guess is that some or many prisoners used both methods, reckoning that at least one might work. The postcard below was posted at CHUSOVSKAYA VOKSAL 13 3 19 [ probably Old Style ]. The station still exists, east of Perm and north west of Yekaterinburg. It was then under the White control of Admiral Kolchak's armies. Like many cards it communicates mainly about failures of communication: I haven't received any mail from you - often followed by "Why haven't you written?" - and giving details of the communications the writer has previously sent and intends to send. This one is a bit more interesting because the writer (Vichtor Sitte) realises that the problem lies with "der Post und die Kämpfe der Parteien" [ the Post and the conflict of the parties ]. He also says that things are now better and the Post is working again. He asks his correspondent to send him old Newspapers or reading matter. And he points out to his correspondent that he does not use the term "Prisoner of war" [ abbreviated here to "Kriegsgef".] in the address he is supplying, which is the address of the Chusovskaya Station. He says that this is much better and more reliable. Unfortunately, you have to pay the Postage. 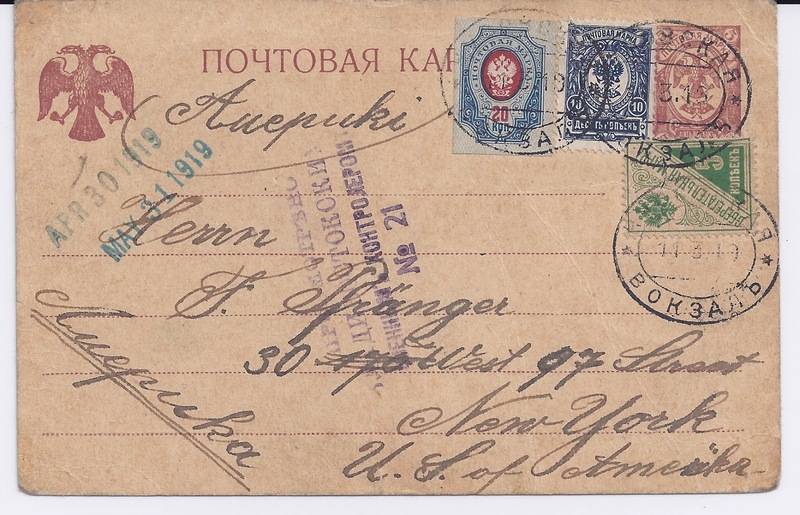 The card was routed to Vladivostok where it was censored - see the violet cachet No. 21 - and it looks like it arrived at its New York destination in about a month and was answered - see the two cachets top left in green-blue. It is possible that the sender had philatelic interests, since the card shows both a 5 kop Savings bank stamp and a 20 kop imperforate stamp (the latter rarely seen), but he makes no mention of the stamps in his message. I guess that that the sender was German-speaking Czech or possibly German. He knows some Russian. First, frank-free privilege applied to mail sent by POWs to their home countries only. Second, although the Red Cross allowed marking the mail of internees "POW," it did not require to provide free mailing: it was left to the discretion of national governments. Thus, British internees in Germany did not pay, while internees from Central Powers in Russia had to pay in full. Third, frank-free privileges ended with the end of hostilities. So, this postcard had to be franked.